Goa Gong or Gong Cave is the most beautiful cave in Pacitan; it said to be the most tremendous cave in Java Island and even in Southeast Asia. This is because the exotic of this cave is more precious than any other cave in Java Island. 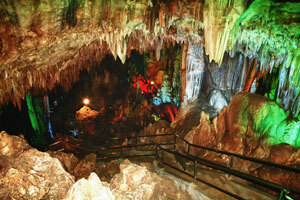 Gong Cave has stalactite and stalagmite that is said becomes the most beautiful one in Southeast Asian. It has about 256 m depth, it also has 5 polls, which is Rogo Pool, Panguripan Pool, Jiwo Pool, Kamulyan Pool, and Ralung Nisto Pool, which have magical value to heal disease. Goa Gong is lies inside the Gong-Gongan Mountain, administratively in Pule Hamlet, Bromo Village, Punung Sub-district, Pacitan. It is about 37 Km to the west from down town Pacitan. The name of Goa Gong is taken from the Stalactites and the Stalagmites that can make sound if it hit, just like the sound of Gong, a traditional Javanese instrument. To reach Goa Gong is relatively easy and becomes easier if it reached from Yogyakarta (Wonosari) or Solo, Central Java. The road is wide and comfortable to be through. After passing the village road, the location becomes narrow and this is the time to slow down the vehicles. On certain days every Friday, there will be sound called "Jaranan" gong (traditional gong). However, Goa Gong has some spaces in the form of giant dome for about 100m long, 15-40 m wide and 20-30 m high. The entrence cave is in the form of short hallway that full of Stalactites and the Stalagmites; those Stalactites and the Stalagmites are connecting the entrence and the dome cave. To reach the location can be done by using motorcycle, bus or private vehicles, and it can easily be reach by passing the good-condition road.